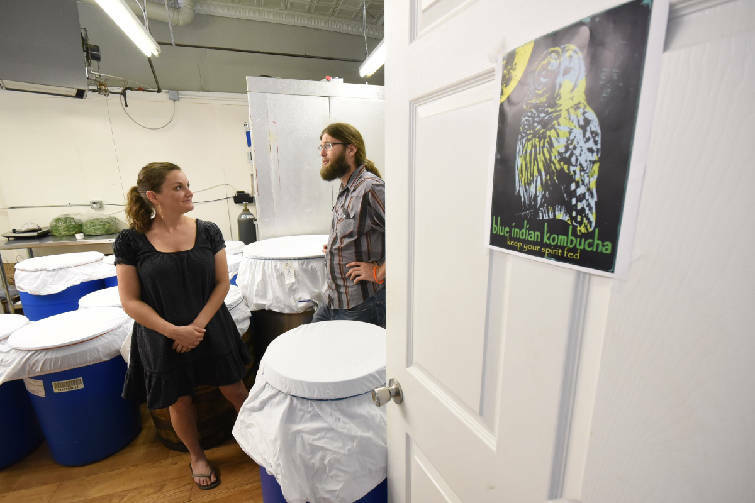 In Olde Town Brainerd, Karen and Zach Atchley talk about their Blue Indian Kombucha, a fermented tea, that is popular with health-minded people in Chattanooga. POLL: Do you believe in the health benefits of kombucha? 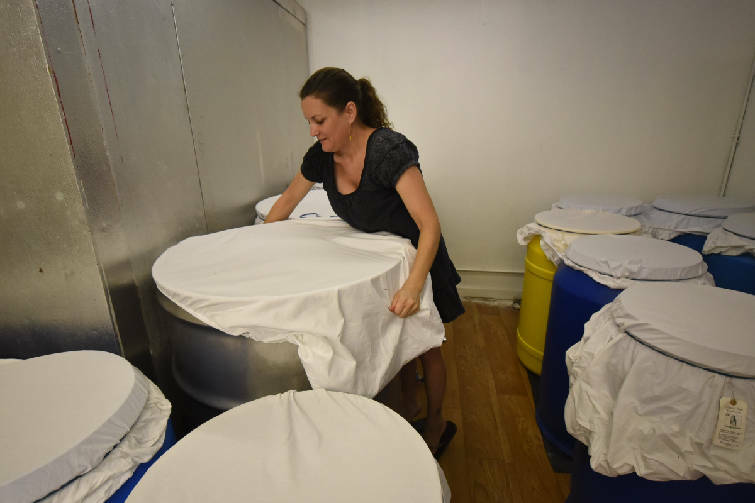 In Olde Town Brainerd, Karen Atchley covers one of the stainless steel barrels that contains their unique batch of their Blue Indian Kombucha, a fermented tea, that is popular with health-minded people in Chattanooga. "I started homebrewing and got obsessed with it," Zach Atchley said. Kombucha is made using a SCOBY, which stands for a symbiotic colony of bacteria and yeast. It's a blobby, leathery, gelatinous disk that floats inside a vat of tea. The yeast consumes sugar and produces alcohol, Zach Atchley said, and the bacteria consumes alcohol to produce organic acids thought to aid human digestion. Another health benefit, he said, is that kombucha only has a fraction of the sugar soda does, or about five grams per 12 ounces of kombucha, compared to about 40 grams of sugar for soda that size. The drink's bacteria and yeast are probiotic, or microorganisms thought to be beneficial to the body. "It's full of probiotics, just like eating Greek yogurt," Zach Atchley said. The Atchleys make their kombucha in 55-gallon and 110-gallon containers and — as an experiment not yet released to the public — a Jack Daniels Tennessee Whiskey barrel. Their kombucha is lab-certified to contain less than 0.5 percent alcohol, so it is not subject to alcohol laws. They mark July 2014 as the date they perfected their recipe. The Atchleys started selling their kombucha, which retails for 25 cents an ounce, at the Brainerd Farmers Market near Grace Episcopal Church on Brainerd Road and plowed the profits back into the business. They've expanded to sell it elsewhere, including the Main Street Farmers Market held Wednesdays from 4 to 6 p.m. at 325 E. Main St. The Atchleys will fill any container from their keg, as long as the container is clean and shows its capacity. "We will never bottle," Zach Atchley said. "We're a zero-waste company." Some of their popular kombucha flavors are blueberry ginger and blackberry sage. "We specialize in pairing fruits with herbs," Karen Atchley said. For example, Heaven & Ale, a craft beer tasting room and growler store at 304 Cherokee Blvd., blends beer with Blue Indian Kombucha to make "beer-bucha." Root Kitchen & Wine Bar at 313 Manufacturers Road near Whole Foods uses the Atchleys' kombucha to make cocktails. 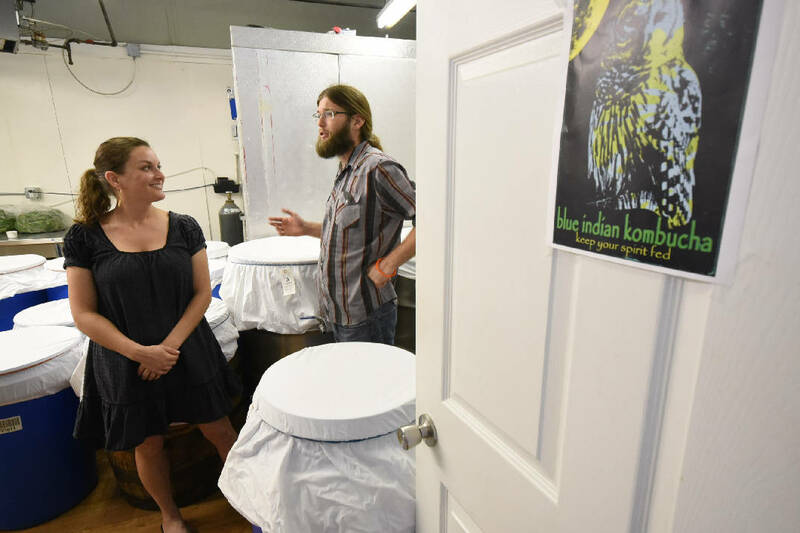 And Blue Indian Kombucha was recently made available on tap at The Edney Innovation Center, an 11-story office building downtown at Market and 11th streets, as a perk for the people who work there. "We know what people in the building like," said Mary Stargel, community manager at the Society of Work, a shared work space inside the Edney. The Atchleys sell about 80 gallons of kombucha a week. But they hope to grow, since Karen, a stay-at-home mom, who has more time, since their older daughter reached kindergarten age. The Atchleys also hired their first part-time employee. Zach has a master's degree in public administration from the University of Tennessee at Chattanooga, and works at the Glass House Collective, a nonprofit organization that aims to revitalize that East Chattanooga neighborhood. The Atchleys live in Olde Town Brainerd, near their kombucha brewery. Contact staff writer Tim Omarzu at tomarzu@timesfreepress.com or www.facebook.com/MeetsForBusiness or Twitter @meetfor business or 423-757-6651.